and have some very exciting classes in store for you. I'll leave the 2016 camps up so you can see what to expect. We are excited to be getting Summer classes posted. This year we will move to online registration so when that is all set we will open things up in early April. We keep our classes small and they fill up quickly so you will want to register quickly to avoid disappointment. 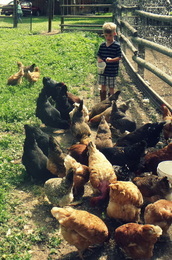 There are many classes available so we are hoping that you will be able to get some fun farm time in this summer. A sweet note: Horse classes with Kat are mostly hands on with horses so let's make sure it's the real horse lovers that sign up for these. We want to make sure the kids get the most out of their horse class with the small size and teacher focus. We greatly appreciate it. We are offering more farm classes weekly that will incorporate nature activities, garden, farm play and horse riding. Come and explore animals, garden and nature on the farm. We will be exploring bugs in the garden and talking about the role of beneficial insects. We will get our hands dirty in the garden, explore the nature around us and learn about life on the farm all in a fun outdoor setting while creating a relationship with the world around us. Please send your child with water, lunch and a snack. Pony Camp is a fun way for children to spend time on the farm and get lots of time with our horses and ponies. 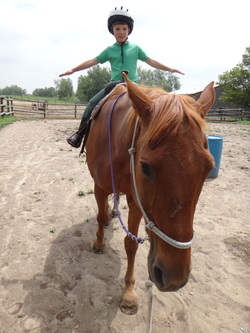 In addition to joining in on a full round of farm chores feeding chickens, pigs, and playing in the hay barn, we'll spend LOTS of time with the horses, grooming, leading, saddling, learning about parts of the horse and then learning the basics of riding. And if it gets too hot, we'll just declare it time for horse baths! Please send your child with water, lunch, a snack, boots, and long pants. Children need boots or sturdy shoes that cover the toes when working with horses. We’ll spend each day doing farm chores and learning about horses, and we’ll also do horse games, learn how to rope, and create some cowboy and cowgirl art. Of course there will be time to swing in the hay barn and maybe wrangle a goat or two. Please send your child with water, lunch and a snack. Children need sturdy shoes that cover the toes when working with horses. Come and explore animals, garden and nature on the Farm. We will be planting herbs and exploring our senses. We will get our hands dirty in the garden, explore the nature around us and learn about life on the farm all in a fun outdoor setting while creating a relationship with the world around us. Please send your child with water, lunch and a snack. We will explore the first days of summer learning and creating Sun Dials. You will hands on create a sun dial to take home, we will journey through the garden, get dirty and plant. Learn the farm life and the nature around us. Please send your child with water, lunch and a snack. We’ll spend each day doing farm chores and learning about horses, and we’ll also do horse games, learn how to rope, and create some cowboy and cowgirl art. Of course there will be time to swing in the haybarn and maybe wrangle a goat or two. Please send your child with water, lunch and a snack. Children need sturdy shoes that cover the toes when working with horses. This camp is for more advanced riders. Riders must be able to safely lead, groom, and ride horse without assistance. We will spend the majority of our time in the arena with multiple horses. We will practice trotting (posting and sitting), circles, patterns, and more. If time allows we will bathe the sweaty horses after our ride. During lunch riders will get homework that needs to be completed and turned in the following day. Please prompt your riders to come to camp with goals they have for their riding or horsemanship, as we will be discussing these and helping each rider move in the direction they are looking to go. Send your child with a water bottle, lunch, boots, and long pants. Three longer days of art exploration for the older artist. We will use the farm as creative inspiration for a bit of bookbinding, sketching, painting, nature and fabric art. This camp concludes with an art show for family and friends. Artists should wear clothes for getting messy and bring water, snack and lunch. Get your children outside, moving, playing, working, connecting with animals and other kids! We will share farm life, the jobs and the adventures together with farmers of all ages (including parents). On any given day we might gather eggs, groom the ponies, train the goats, work in the garden, go on nature adventures, build forts, swing in the haybarn, snuggle with the bunnies and just enjoy the day unfold together. We have a relaxed pace, yet manage to get the chores done and have lots of fun. Send your child with a water bottle, lunch, boots, and closed toed shoes. Why do horses get all of the attention? Goats need lots of attention and training also. :) Goats are the perfect size for smaller farmers and we will groom and train our goats, working them around obstacles and helping them learn to listen. This is not easy, but I’m sure you’ll be up to the task! 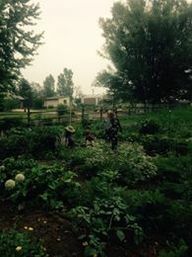 Of course we will have some farm chores to do like feeding the chickens and bunnies, gathering the eggs, and gathering garden goodies for the animals. We will have plenty of play time in the mud kitchen, swinging in the haybarn, and if it’s hot, some water play. Please send your kiddo with a water bottle, lunch, boots, and closed toed shoes. Day 1: Basic camera functions and macro shooting: We will look for tiny things and textures in our environment, and practice getting shots into focus. Day 2: Let there be light! We'll learn how to choose the best camera setting for the natural light and practice taking photos in different lighting situations; direct sunlight, partial shade, in the hay barn etc. We will photograph animals and plants using light and shadows. Day 3: Focus on people portraits: We'll discover how to take posed and candid shots. When imagining a scene, what is the background? Is it better to have a simple background? Does your photo show what the person is doing? We'll learn where to focus so the photos tell a story. Here’s what your child will need: Each child should bring a simple "point and shoot" camera with a blank memory stick, fully charged battery (extra batteries are a plus), battery charger and USB cable in a camera case or special bag. An older or inexpensive camera would be great since accidents can happen. Children will also need a water bottle, a healthy snack and to wear weather appropriate clothing with sturdy, strap-on shoes. We will do a round of farm chores, play in the haybarn, hug the chickens, brush the ponies and get a sense of what life is like on the farm. We could also also have hands on nature activities and / or water fun depending on the day. Please send your child with water, lunch and a snack. Children need sturdy shoes that cover the toes when working with horses. Please send your child with water, lunch and a snack. Come explore the farm and the poetry of being a creature alive on a farm! We will do all our favorite things - digging in the garden, playing in the hayloft, feeding the chickens and goats - but we will be seeing the farm through new senses - the sense of poets. You do not have to be a great writer...we'll become great writers together. We will read haiku and poetry that highlight those senses, and that celebrate what they mean. We will look at the colors and shapes of fenceposts and pigs, feel the dirt of the garden and the leaves of plants, listen to the chickens and horses, and generally indulge in what it feels like to be a creature on a farm...and of course, we will write poetry about it! Everyone should come with water, lunch, a snack, paper (or a notebook/journal) and something to write with. Campers will have hands-on practice with beekeeping and candle making, chicken care and campfire cooking, gardening and food preservation, plus a little stitching and sewing! Homesteaders should wear clothes for getting messy and bring water, snack and lunch. On Summer Farm Days we will explore the children’s garden, play in the haybarn, learn about horses, hug chickens, and get a sense of what life is like on the farm. We could also have hands on nature activities and / or water fun depending on the day. Please send your child with water, lunch and a snack. Children need sturdy shoes that cover the toes when working with horses. all ages Parents stay with 3 and under. Drop off OK.
*Oxymel: a mixture of vinegar, herbs, and honey that may be used during cough/cold season as an expectorant or in food, as in a vinaigrette.